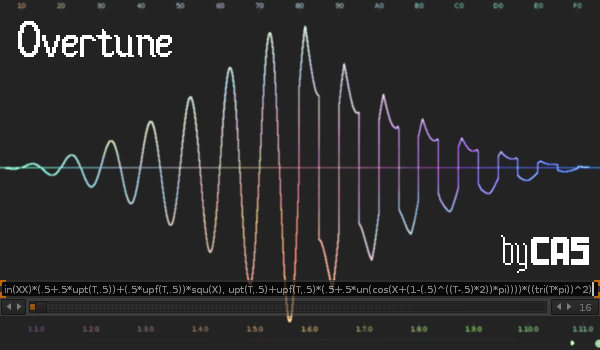 Overtune is a Renoise tool that has some of the features of CustomWave, but requires a little “mathematic fantasy” to control. It’s a very simple tool with advanced capabilities. Download here. Please note that since v2.5 there’s a difference in how the settings are saved, so that it is possible to have multiple Overtune samples in one instrument (and still access them). Also it’s now finally possible to select rendering resolution or which ‘base note’ is to be used. All these things are the steps necessary for development of v3. The current version is 2.5.983. "local pi = math.pi " ..
"local lowrnd_buf = 0 local lowrnd_step = 0 " ..
"local lownoi_buf = 0 local lownoi_step = 0 " ..
"local quantz_buf = 0 local quantz_step = 0 " ..
"local sin = math.sin " ..
"local cos = math.cos " ..
"local tan = math.tan " ..
"local asin = math.asin " ..
"local acos = math.acos " ..
"local atan = math.atan " ..
"local sqrt = math.sqrt " ..
"local max = math.max " ..
"local min = math.min " ..
"local mod = math.mod " ..
"local rnd = function() return 2*math.random()-1 end " ..
"local urnd = math.random " ..
"local flr = math.floor " ..
"local abs = math.abs " ..
"local equ = function(x) return x end " ..
"local sin1 = function(t) return sin(t*2*pi) end " ..
"local squ1 = function(t) return squ(t*2*pi) end " ..
"local tri1 = function(t) return tri(t*2*pi) end " ..
"local saw1 = function(t) return saw(t*2*pi) end " ..
"local un = function(x) return (x+1)/2 end " ..
"local bi = function(x) return x*2-1 end " ..
"local tt = function(x) return x/2/pi end " ..
"local tx = function(t) return t*2*pi end " ..
--"local fm = function(c,m,a) return c*(1+m*a) end " ..
"local am = function(c,m,a) return c*(1-a+un(m)*a) end " ..
"local rm = function(c,m,a) return c*(1-a+abs(m)*a) end " ..
"local nf = function(txp) return (2^(txp/12)) end " ..
"local ite = function(i, t, e) if i then return t else return e end end " ..
"local btoi = function(b) if b then return 1 else return 0 end end " ..
"local itob = function(i) if i<=0 then return false else return true end end " ..
--"local saw = function(x) return math.mod(((x-(1/tl))+pi)/pi, 2)-1 end " ..
"local saw = function(x) return 2*atan(tan(x/2))/pi end " ..
"local squ = function(x) return (flr(sin(x)/2+1)*2-1) end " ..
"local tri = function(x) return abs(1-mod((x+1.5*pi)/pi,2))*2-1 end " ..
"local expsin = function(x, p) if p>1 then return (squ(x)^(1-p%2))*sin(x)^p else return squ(x)*abs(sin(x))^p end end " ..
"local expsaw = function(x, p) if p>1 then return (squ(x)^(1-p%2))*saw(x)^p else return squ(x)*abs(saw(x))^p end end " ..
"local exptri = function(x, p) if p>1 then return (squ(x)^(1-p%2))*tri(x)^p else return squ(x)*abs(tri(x))^p end end " ..
"local sinsin sinsin = function(x, p) if p>1 then return sinsin(sin(x), p-1) else return sin(x) end end " ..
"local sinsaw sinsaw = function(x, p) if p>1 then return sin(x*p)/p+sinsaw(x, p-1) else return sin(x) end end " ..
"local sftsaw sftsaw = function(x, p) if p>1 then return sin(x*p)/(2^p)+sftsaw(x, p-1) else return sin(x) end end " ..
"local sinsqu sinsqu = function(x, p) if p>1 then local v = p*2-1 return sin(x*v)/v+sinsqu(x, p-1) else return sin(x) end end " ..
--"local awehelp = function() end " ..
--"local awesin = function(x, d, c, rdf) end " ..
--"local awesin awesin = function(x, c) if c <= 1 then return sin(x) else local pdec=(sf-1)^c return (0.2^c)*(sin(x*(1+pdec))+sin(x*(1-pdec)))+awesin(x, c-1) end end " ..
--"local awesin awesin = function(x, c, d) if c <= 1 then return sin(x) else local pdec=d*(sf-1)^c return (0.5^c)*(sin(x*(1+pdec))+sin(x/(1+pdec)))+awesin(x, c-1, d) end end " ..
--"local awesaw awesaw = function(x, c) if c <= 1 then return saw(x) else local pdec=(sf-1)^c return (0.2^c)*(saw(x*(1+pdec))+saw(x*(1-pdec)))+awesaw(x, c-1) end end " ..
"local sqtfunhelp sqtfunhelp = function(fun, x, p) if p>1 then return sqrt(sqtfunhelp(fun, x, p-1)) else return abs(fun(x)) end end " ..
"local sqtsin = function(x, p) return squ(x)*sqtfunhelp(sin, x, p) end " ..
"local sqtsaw = function(x, p) return squ(x)*sqtfunhelp(saw, x, p) end " ..
"local sqttri = function(x, p) return squ(x)*sqtfunhelp(tri, x, p) end " ..
"local shape = function(x, p) if x==0 then return x else return (x/abs(x))*abs(x)^p end end " ..
"local semishape = function(x, p, z) return shape(x,p)*z + (1-z)*x end " ..
"local clip = function(x, y) return (1/y)*max(min(x, y), -y) end " ..
"local semiclip = function(x, y, z) return (max(min(x, y), -y)*z + (1-z)*x) end " ..
"local clipp = function(x, y) return max(min(x, y), -y) end " ..
"local semiclipp = function(x, y, z) return (max(min(x, y), -y)*z + (1-z)*x) end " ..
"local expand = function(x, y, z, p) local a=abs(x) local s=a/x if a<(y-z) then return x end local b = (a-(y-z))/z local c = z*b^p return x+s*c end " ..
"local fold = function(x, y) return -bi(abs(1-abs(un((1+y)*x)))) end " ..
"local semifold = function(x, y, z) return fold(x, y)*z + (1-z)*x end " ..
"local crush = function(x, y) return flr(x*y)/y end " ..
"local semicrush = function(x, y, z) return (flr(x*y)/y)*z + (1-z)*x end " ..
"local quant = function(x, dx) if quantz_step == 0 then quantz_buf = x end quantz_step = mod( quantz_step + 1, dx ) return quantz_buf end " ..
"local semiquant = function(x, dx, z) return quant(x,dx)*z + (1-z)*x end " ..
"local lowrnd = function ( t, skip ) if lowrnd_step == 0 then lowrnd_buf = rnd() end lowrnd_step = mod( lowrnd_step + 1, skip ) return lowrnd_buf end " ..
"local lownoise = function ( t, part ) if lownoi_step ~= flr(t*part) then lownoi_buf = rnd() end lownoi_step = flr(t*part) return lownoi_buf end " ..
"local muffle = function(x, y, z, p) local a=abs(x) local s=a/x if a<(y-z) then return x end local b = (a-(y-z))/z local c = z*(b/p)^p return x-(s*c)/p end " ..
"local ubermuffle = function(x, y, z, p) local a=abs(x) local s=a/x if a<(y-z) then return x end local b = (a-(y-z))/z local c = z*(b/p)^p return x-(s*c) end " ..
--"local brutalize = function(x, y, z, p) local m=min(abs(x),y-z) return (x/abs(x))*(m+z/((1/(abs(x)-m))^p)) end " ..
--"local muffold = function(x, y, z, p) local a=abs(x) local s=a/x if a<(y-z) then return x end local b = (a-(y-z))/z local c = z*b^p return x-s*c end " ..
"local supermax = function(x, y) if x >= 0 then return max(x,y) else return min(x,y) end end " ..
"local supermin = function(x, y) if x >= 0 then return min(x,y) else return max(x,y) end end " ..
"local morph = function(x, y, z) return ((1-z)*x+z*y) end " ..
"local mix = function(f1, f2, x, a) return ((1-a)*f1(x)+(a)*f2(x)) end " ..
--"local mix = function(x, ztab, functab) local factor = 0 if #ztab ~= #functab then return 0 else for _,f in ztab do factor = factor + f end local res = 0 for i = 1, #ztab do print(''..i..'. type: '..type(functab[i])) if type(functab[i]) == 'function' then res = res + ztab[i] * functab[i](x) elseif (#functab[i]) == 1 then res = res + ztab[i] * functab[i](x) else res = res + ztab[i] * functab[i](x, unpack(functab[i])) end end return res/factor end end  " ..
"local upft = function(x, f, t) if x < f or x >= t then return 0 else return 1 end end " ..
"local upf = function(x, f) if x < f then return 0 else return 1 end end " ..
"local upt = function(x, t) if x >= t then return 0 else return 1 end end " ..
"local sqrtsqrt = function(x, p) return sqtfunhelp(equ, x, p) end " ..
"local rd = function(t, p) return (1-t)^p end " ..
"local ard = function(t, p) return 1-t^p end " ..
"local rrd = function(t, p) return 1-sqrtsqrt(t, p) end " ..
"local rard = function(t, p) return sqrtsqrt(1-t, p) end " ..
--"local cosd = function(t, p) return (cos(t*pi)/2+.5)^p end " ..
"local cosd = function(t, p) return shape((cos(t*pi)/2+.5)*2-1,1/p)/2+.5 end " ..
--"local acosu = function(t, p) return (acos((1-t)*2-1)/pi)^p end " ..
--"local acosd = function(t, p) return (acos(t*2-1)/pi)^p end " ..
"local acosu = function(t, p) return shape(((acos((1-t)*2-1)/pi)*2-1),p)/2+.5 end " ..
"local acosd = function(t, p) return shape(((acos(t*2-1)/pi)*2-1),p)/2+.5 end " ..
"local atand = function(t, p) return (math.atan(1-t*2)/pi*2+.5)^p end " ..
"local recu = function(t, p) local q = 1/p return (p+1)*(q/((1-t)+q)-(1/(p+1)))/p end " ..
"local recd = function(t, p) local q = 1/p return (p+1)*(q/(t+q)-(1/(p+1)))/p end " ..
"local dq = function(t,p) return min(t/p,1) end " ..
"local env = function(x, t) local y = 0 local pc local pn = nil for i = 1, #t-1 do if pn ~= nil then pc = pn else pc = t[i] end pn = t[i+1] if x < pn and x >= pc then if pn == nil or pn == nil then y = ((x-pc)/(pn-pc))*(pn-pc)+pc else y = pn(((x-pc)/(pn-pc)),pn)*(pn-pc)+pc end break end end return y end " ..
There’s also a new env function that needs 2 arguments, the T var and a table of (x,y) coords. It generates a custom envelope. Every coord in the table except for the first one can also specify one of the ramp functions to modify how the lines are drawn in the final envelope. Good example usages of these are in the envelopes.xrns file. Note: the rest of this page is still based on Overtune v1. This will soon be updated, but most of the steps hereunder are still the same. If you hear a piano player strike the A key, it does not only play at a 440Hz frequency, but also at 660Hz, 880Hz, 1320Hz, 1760Hz, and so on. Of course, every step away from the original ‘base’ frequency normally sounds less loud. In some way the human ear captures all these resonances of multiplied frequencies and perceives them all together as one note still. To try and simulate the sounds of pianos, guitars, and many other types of instruments, synthesizer makers started experimenting with square, triangle, and sawtooth type waves. Now with Overtune, a little mathematical knowledge, and a strong will to keep trying, anyone can create their own synthesizer sound. this is then looped by Renoise to create a sound. If you leave the formula math.sin(X) in the first field, and then either just put a zero (0) in the second field or reduce the steps amount to the minimum (1), you can play a very pure (and very boring) synthesized sinewave-sound. However this boring sound is the base of many cool synthesizer sounds/waves. Keep this one in mind (or on paper of course), the square wave is really handy for turning (e.g. modulated) math.abs() formulas back into full shape. Alright that’s something.. but I want a double saw, no, actually, a triangle! No problem – you can make it out of this although the formulas are sometimes annoying to type in as fast as you can come up with them. I don’t know why the +0.1 is necessary, just is. 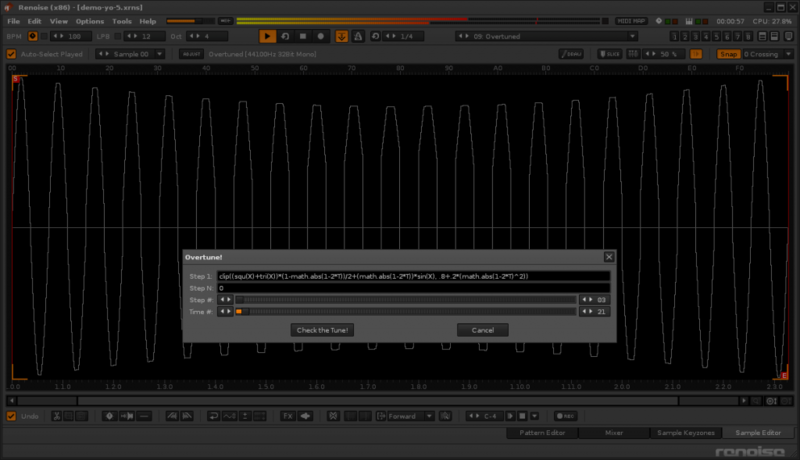 I’ve made a simple drumkit already, compose purely out of transposed overtune renders. Of course these will be available at some point in the future as well. A nifty thing is that with Renoise 2.8 you can also easily take two slightly different ‘overtuned’ waveforms together, and e.g. phase invert one of them and then put them in an instrument on the left & right channel.